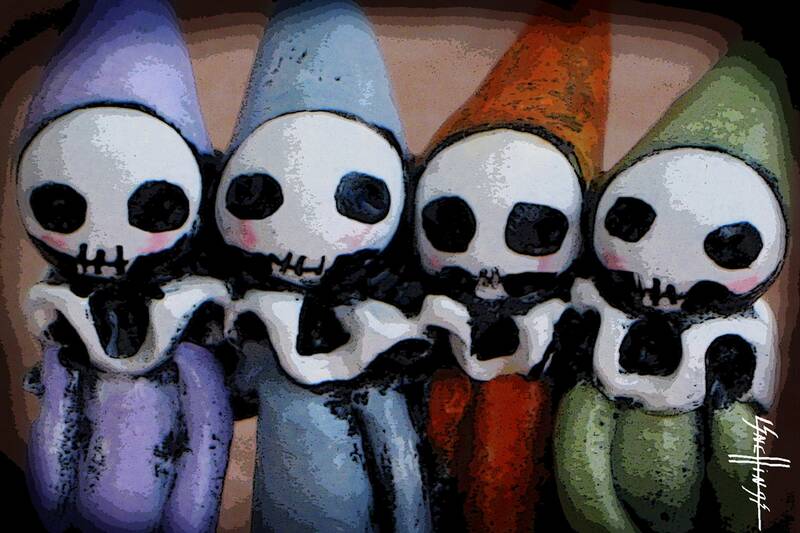 Poppets celebrate Day of the Dead. Whenever they want. Poppets love to explore. On every level. Also available as a physical print in the Posters section. The physical prints are signed. This is a downloadable jpg file to print out on any type of paper you like. I recommend a semi gloss or glossy photo paper for best results. It will print out in a variety of sizes. Good resolution up to 13 x 18 inches. * This item is a digital file, no physical item will be sent. As soon as you check out your file will be available immediately to download. There are no shipping charges or waiting. * A digital page can be printed out multiple times in different ways. * Please note that this image is copyright protected and is for your personal use only, not for resale. We accept Paypal and major credit cards through Etsy. You can contact us to make arrangements for checks, money orders, and layaway. Generally, "layaway" payments are the total divided into three payments, no more than 30 days apart. We will refund money if item is returned within seven days of receiving the item. Items can be sent for repair free of charge,buyer pays for shipping. We want you to be happy! Please don't hesitate to contact us with questions or problems. We'll make things right. We will gladly consider custom orders and consignment. Just convo us here! We love hearing your ideas and love the opportunity to delight and surprise you.